The Glyndebourne Opera Cup – an international competition for opera singers is designed to discover and spotlight the best young singers from around the world, offering a top prize of £15,000 and a platform for launching an international opera career. The competition will take place every two years, each time focused on a different single composer or strand of the repertoire, in order to cater for the various specialisms within operatic training and to ensure competitors can be accompanied by an orchestra with instruments appropriate for the period. Eligibility criteria, including age limit, will vary to reflect the chosen theme. The competition has been devised by Sebastian F. Schwarz, who chairs the judging panel. Acting as the competition’s honorary president is Dame Janet Baker, whose own early career was fostered by Glyndebourne. As well as presenting the prizes, she will adjudicate at the live final in 2018. Find out more about the first winner of the Glyndebourne Opera Cup. The inaugural Glyndebourne Opera Cup has come to an end. Take a look back at the journey of the finalists and relive the excitement of our first ever international singing competition. 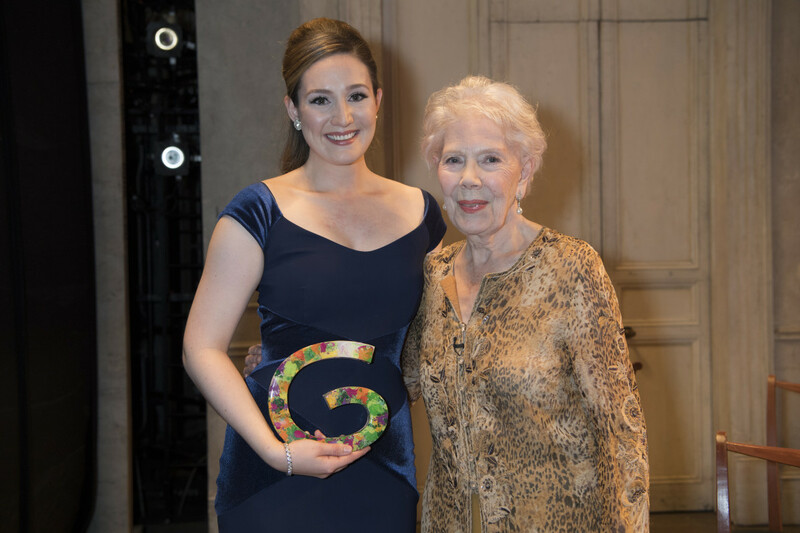 Mezzo-soprano Samantha Hankey, 25, from the USA, was crowned the overall winner, receiving £15,000 and the guarantee of a role within five years at one of the top opera houses represented on the competition jury. A native of Massachusetts, Hankey attended the Merola Opera Program in San Francisco and recently graduated from The Juilliard School. In 2017/18 she makes her debuts as Rosina in Il barbiere di Siviglia at Den Norske Opera, Siébel in Faust at Grand Théâtre de Genève, and her Carnegie Hall debut in Handel’s Messiah with Musica Sacra. She was Grand Finals winner of the 2017 Metropolitan Opera National Council Auditions and first prize winner of the Dallas Opera Guild Competition. Winning the Audience Prize, with a third of all votes cast by those in the auditorium who watched the final, was Kosovan soprano Elbenita Kajtazi, 27. Kajtazi as a young girl was forced to flee her home in war-torn Kosovo with her family, and live as a refugee in Albania. ‘Every time there would be a dangerous situation – the soldiers would come into our house or something like that – I would find a corner and sing to myself. Singing was my way to be able to feel safe,’ she recalls. Kajtazi also took Third place. Second place went to American soprano Jacquelyn Stucker, 28, currently a Jette Parker Young Artist at the Royal Opera House, where she recently performed the role of Frasquita in Barrie Kosky’s production of Carmen. The Ginette Theano prize for most promising talent was awarded to American soprano Emily Pogorelc, 21. Pogorelc was the youngest competitor to reach the final and is currently entering her final year at the Curtis Institute of Music. How can I take part in the competition? How can I watch the competition? Sky Arts, Glyndebourne’s official UK broadcast partner, will bring the competition to a wider audience with a dedicated TV series. Following each stage of the competition, the series will feature preliminary rounds in a number of international cities, culminating in the finals at Glyndebourne, and will allow audiences to learn more about the individual competitors involved. Viewers outside the UK will be able to watch the final and semi-final on Medici.tv.